When I first saw Petra’s famous Treasury it was 106 degrees Fahrenheit (41 degrees Celsius) and I was running on three hours of sleep. We had crossed the border from Israel into Jordan that morning, which required us to rise long before the sun so we could catch a flight from Tel Aviv to Eilat. There, we crossed the border on foot and spent two-and-a-half hours in a car so we could spend just one day exploring Petra. The lack of sleep and the heat left me feeling drained as we started our trek from the visitor’s center into Petra, winding our way through a narrow passage known as the Siq. At one point, our guide Hassan asked us to pause and directed our gaze to a spot on the ground just opposite from us. We walked toward it, looking down at the ground, turning only when Hassan told us to do so. 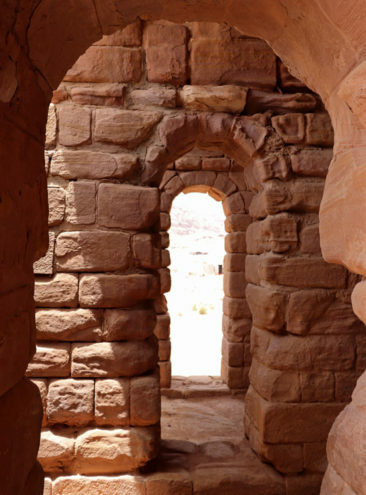 In front of us, peeking out from the curving sandstone, stood the Treasury. As Hassan explained to us, the “spot” on the ground was just a diversion so we would be positioned in exactly the right place when we saw the magnificent building for the first time. In that moment I forgot about my fatigue, the heat, and even the other people standing nearby. 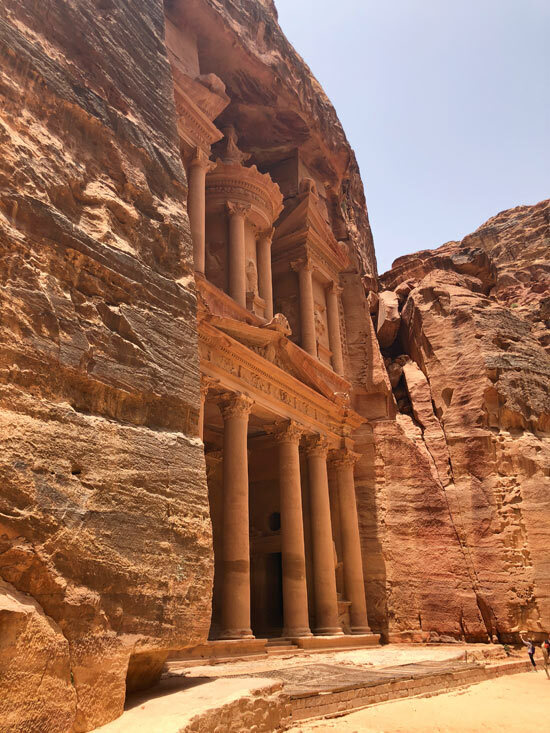 As I stood just yards away from the Treasury and saw it for the first time with my own eyes, my energy and fascination with Petra was restored: I knew then the long journey was worth it. Although Jordan is an incredible country with plenty to see and do, its most popular attraction is Petra. More than 500,000 people make the same trek we did each year to stand before the incredible rose-colored Treasury. It’s easy to spend a very fulfilling day at Petra, and although squeezing our visit in between our days visiting Jerusalem and Giza required some lengthy car rides and a few extra flights it was one of our favorite stops during a jam-packed itinerary. 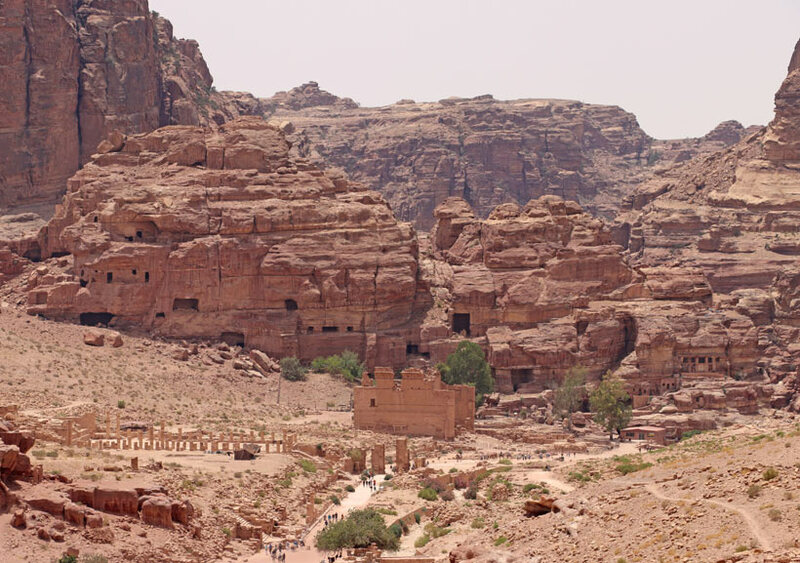 If you are planning to visit Petra—or if you’re deciding whether it is worth a few of your vacation days—this overview of what you will learn, see, and experience will help you make the most of your visit! Petra was most likely founded in the first or second century BC, but the ancient people who lived there were likely in the region for thousands of years before the city was built. 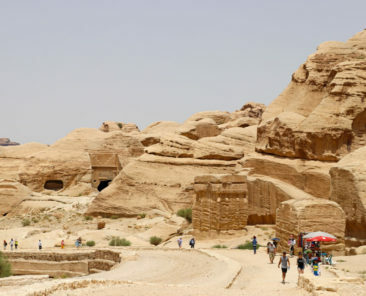 The Nabataeans were a resourceful people who developed strong storage, transportation, and irrigation systems throughout Israel and Jordan. 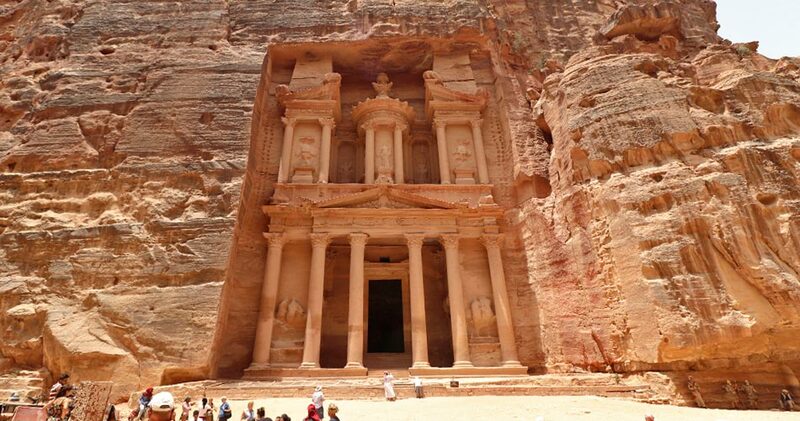 Using their knowledge and familiarity with the region, they constructed Petra around the first century AD. The landscape was soon dotted with ornate buildings carved directly into the pink sandstone, and innovative water harvesting and retention systems were in place to store water collected during the rainy seasons. 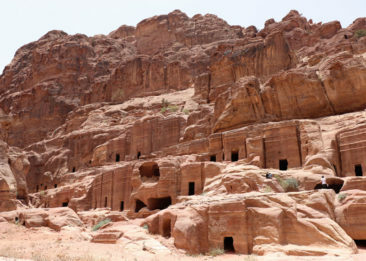 Petra was known for its wealth; its geographic location connected it to Jerusalem, Amman, and Syria, which made it a great trading city. That reputation resulted in two attacks on the city, one by the Greeks around 300 BC and a second by the Romans around 106 AD. 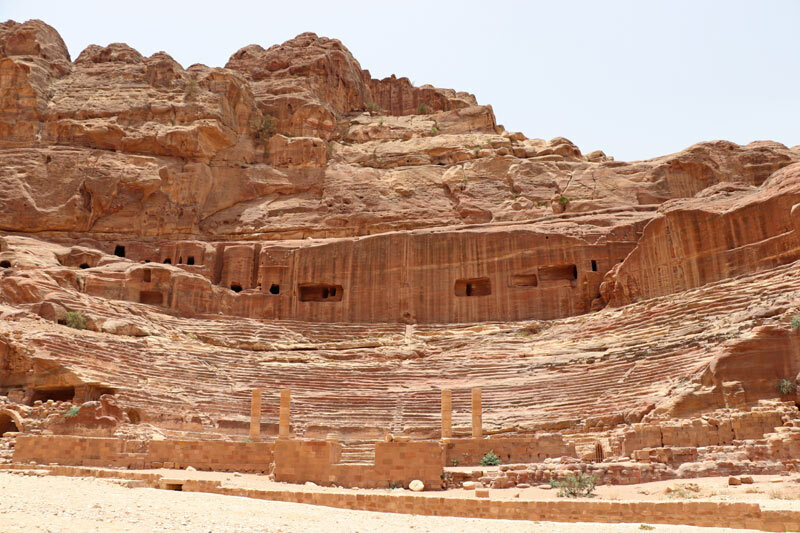 The first attack was significant because it marked the first time Petra was mentioned in recorded history, but the second attack forced the Nabataeans to surrender to the Romans, who controlled the area until it was devastated by an earthquake almost three centuries later. 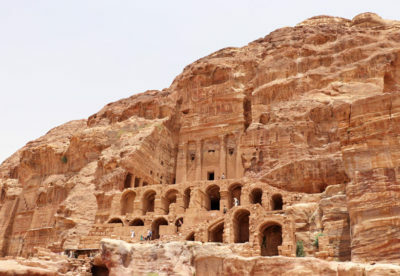 The Byzantines controlled Petra until around the eighth century AD, when the site was mostly abandoned and lost all relevance in the trading community. 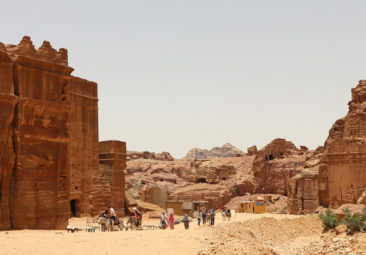 It wasn’t until 1812 when Swiss explorer Johann Ludwig Burckhardt rediscovered and documented Petra, at which point the lost city was found again. Excavations and documents found at the site have helped historians and archaeologists begin to piece together the history and significance of the ancient city. In 1985 Petra became a UNESCO World Heritage Site, and in 2000 it was named one of the Seven New Wonders of the World along with Chichen Itza, Christ the Redeemer, the Great Wall of China, Machu Picchu, the Taj Mahal, and the Colosseum. 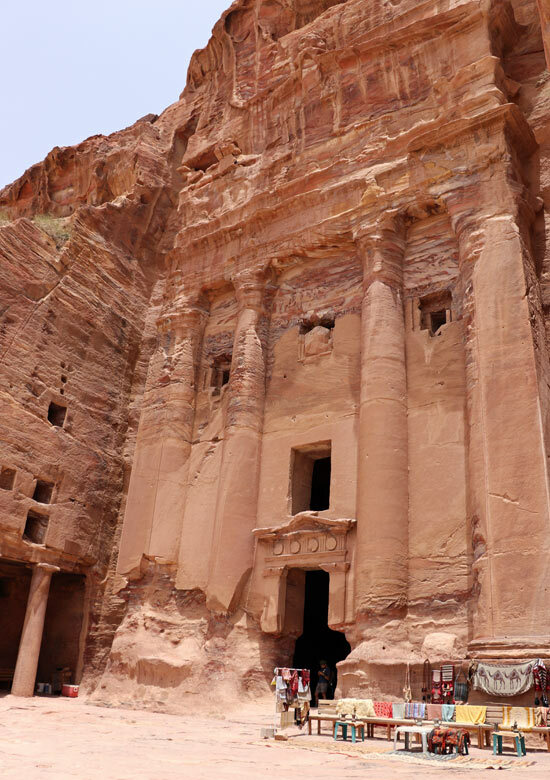 Petra is the kind of place that unveils itself slowly, and there is much more to see than the Treasury, which is certainly its biggest attraction. Any visit to Petra should be unrushed so you can observe and reflect on the natural beauty and ancient carvings that emerge around each turn. Here are some of our favorite spots to see during your day in Petra. Made of natural limestone that winds from the visitor’s center to the Treasury, the Siq is the first place you’ll encounter during your visit to Petra. 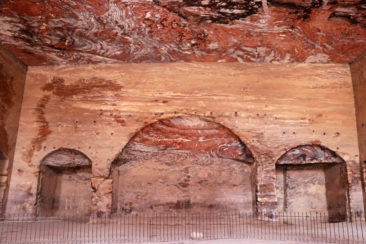 At the height of the city’s relevance the Siq served as the main entrance. The pink and sand-colored walls are tall but narrow; in some places they are no more than 10 feet (3 meters) wide. The walls were carved slowly over the centuries by steam rather than water, which ultimately helped to preserve and protect the structures that were carved into the walls because they slow down the wind. 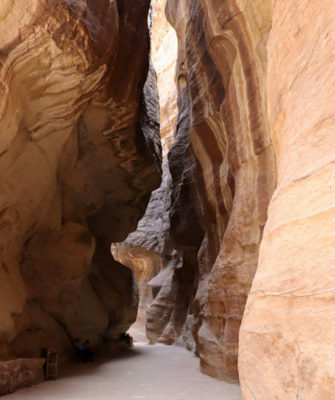 Walking through is reminiscent of similar types of slot canyons, like those found in the USA’s Antelope Canyon, and the journey is made more beautiful by the carvings found at intervals leading to the Treasury. The Nabataeans built monuments only periodically so they would retain significance and mystique, and no two monuments are the same or redundant. They chose locations specifically for the monuments they planned to carve. The monuments are revealed in order of importance, with the most significant monuments closer to the Treasury. Any walk through the Siq benefits from this realization, and it became a bit of a fun scavenger hunt for us as we recognized various carvings around each corner. 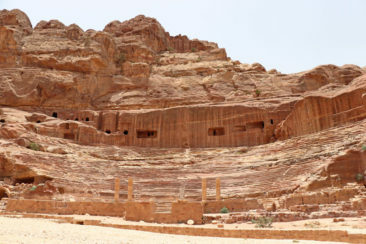 Petra had a nice amphitheater, and today its remnants are part of the landscape. 8,000 spectators could gather in the theater’s seating for performances, and the theater was specifically designed so that the nearby tombs were in view when a performance was held. 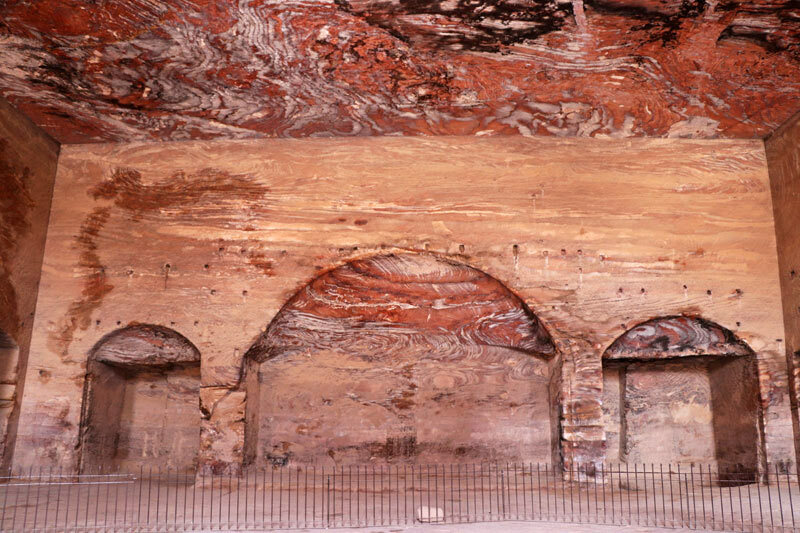 The amphitheater’s acoustic capabilities mirrored those found in Roman theaters constructed during the same time period. Petra’s crowning jewel is its Treasury, or Al-Khazneh. It was initially carved to be a mausoleum for Nabatean King Aretas IV, although it received its nickname from a legend that suggested treasure was hidden in an urn on the second story of the building. The statues carved into the building, including four eagles that would carry souls away to the afterlife, support the mausoleum much more than the idea it is the hiding place for any kind of treasure. Many of the carvings have eroded over time, lending even more mystery to the building. The Treasury is almost synonymous with Petra itself, and plenty of visitors arrive each year to see nothing more than the 130-foot tall building made famous by its appearance in Indiana Jones and the Last Crusade. It’s an unmissable attraction, and its magnificence was just as awe-inspiring as we hoped it would be. Some tourist attractions don’t live up to the hype; the Treasury does. If you haven’t seen Indiana Jones and the Last Crusade (as I hadn’t before our visit—although it has been one of Adam’s favorite movies for a long time, I watched it for the first time in our hotel room that night! ), this famous clip from the end of the movie nicely showcases the Treasury. Spoiler alert—you won’t find an ancient Knight or the Holy Grail inside! From the Treasury, Petra extends for miles. The Street of Facades takes visitors from the Treasury into the heart of what would have been Petra’s bustling city center. Today you’ll see many tombs and carvings etched into the sandstone city, some of which have been shaped by steam over the years like the Siq. It’s a picturesque walk that, in some ways, is enhanced by the merchants who set up shop to sell souvenirs and snacks to tired travelers. While we don’t typically like to see vendors in historic areas like this, some of them have a certain charm in that environment. Centuries earlier, when Petra was at the height of its relevance, people like us would be there to buy and trade with other residents. While no one lives in the city today, you can still take part in the tradition and buy a souvenir or a bottle of water from one of the locals. We were particularly interested in the sand art created by one of the merchants, who showed us how he takes colored sand and creates pictures and images in it. It reminded me of the man who created a beautiful picture using tea, indigo, and fire at Ait Ben Haddou in Morocco, and we enjoyed learning about his craft during our walk. 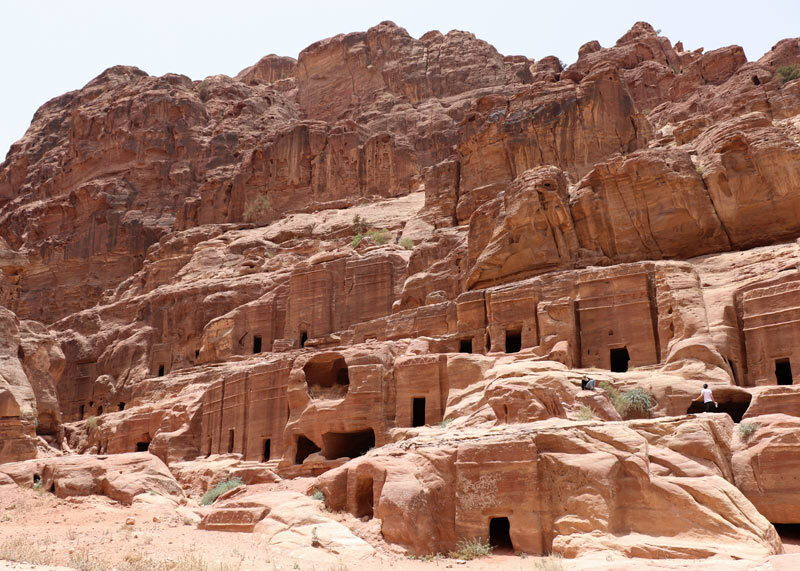 Our walk along the Street of Facades took us up to the Royal Tombs, where a brief hike up several staircases took us to the final resting place of Nabataean King Malchus II. Known as the Urn Tomb, it is built into the mountainside and is the first of the tombs you can approach during your climb. 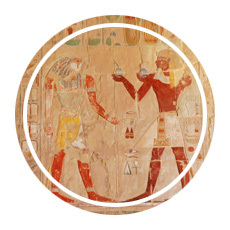 Not far away stands the Silk Tomb, which is recognizable for its vibrant pink color. The Corinthian Tomb bears similarities to the Treasury; with more carvings and detail than the Silk Tomb, it’s easy to locate in the landscape. Finally, the stairs deposit weary visitors in front of the Palace Tomb, which is positioned in front of a courtyard and may have been used for important funerals. 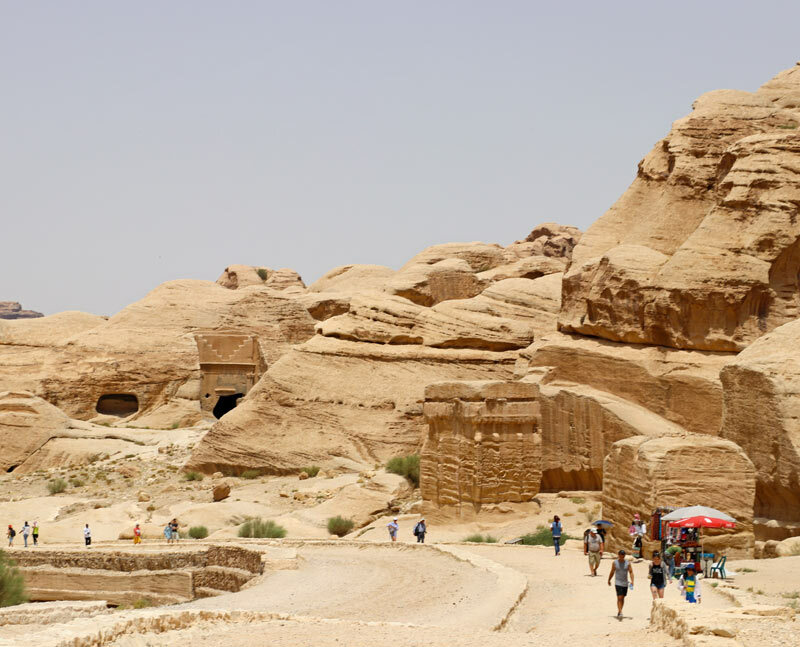 On a hot day the Royal Tombs require some significant effort to visit, but it’s worth the climb to see these incredible structures and the view of the area from the top. 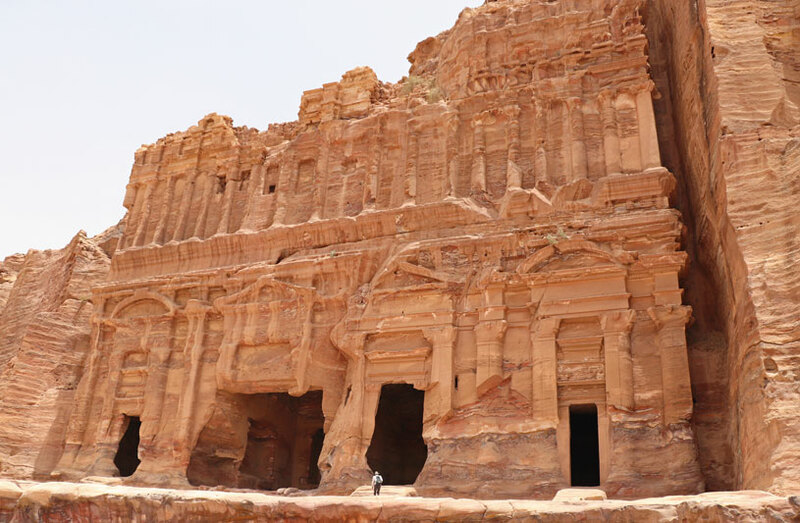 If you are planning a trip to Petra, here are a few tips we learned that might make your visit just as smooth! Upon arrival at the border in Jordan, we purchased our visa (for 60 USD) and were given some entry paperwork. Our guide told us to be sure to keep the paperwork, which had an entry stamp, as it might be requested when we departed from the Amman airport. Later, when we arrived at Petra, the paperwork was stamped again to indicate we had visited the historic site. 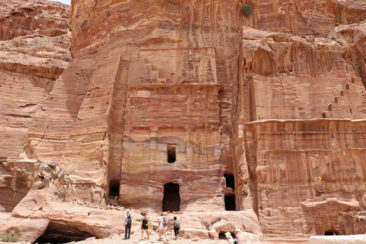 If you visit Petra either independently or with a guide, be sure your paperwork is available and is properly stamped. We heard later that, without a stamp indicating a visit to Petra, some travelers have been charged an additional tax at the airport. We did not encounter this issue (in fact, our paperwork was never reviewed when we passed through immigration), and we don’t know how often this can or might happen, but consider this a reminder that you should always be sure your visa information and paperwork is in order. Keep your Petra entrance ticket with you just to be safe! 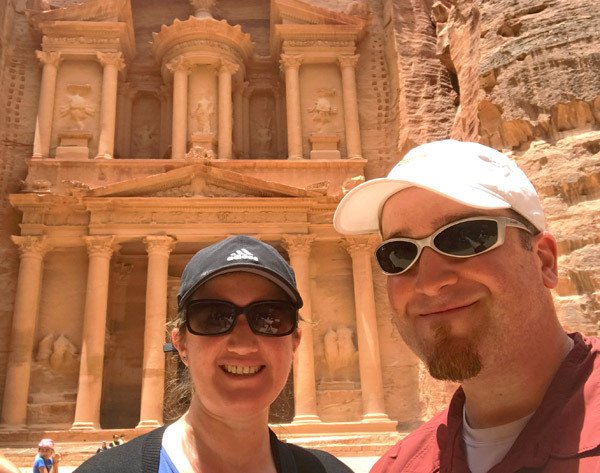 We walked close to ten miles during our visit to Petra, and you may find your curiosity has you exploring with the same intensity that we did. Be sure you have plenty of water available to keep yourself hydrated! Don’t underestimate how dry and unforgiving the heat can be; we found that the sun seemed to bounce off the sandstone walls and made the temperatures feel much hotter than they were. Vendors sell water throughout Petra, so carry some cash (most will not accept credit cards) and don’t hesitate to buy as much water as necessary. With temperatures soaring above 100 degrees Fahrenheit, our visit took place during the hottest part of the day. Carry the basics with you: sunscreen, a hat, and sunglasses will make your visit much more comfortable. 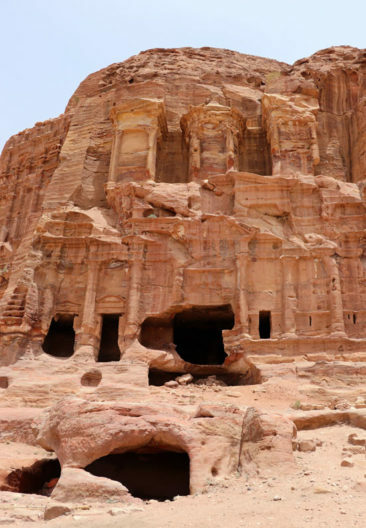 Petra is loaded with incredible sights to see, and if you have the time to spare a two-day ticket would be a great investment. It’s not significantly more expensive than a single day ticket, but it can ensure you have more than enough time to explore the area. Petra requires a lot of walking; at a relaxed pace it took us about 45 minutes to walk from the visitor’s center to the Treasury with stops to talk with our guide about what we were seeing. In total we spent close to five hours walking and hiking our way as far as the Royal Tombs and back again; the walk back took a little longer because of the heat and because it is slightly uphill. Beyond the Street of Facades are a couple of hikes that require some more time. 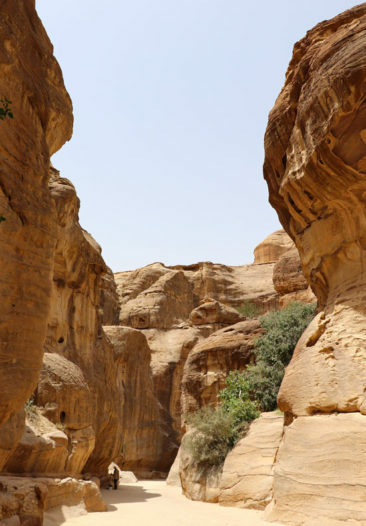 Specifically, there is a beautiful hike to Petra’s Monastery that can add a couple of hours to your day depending on your speed and level of fitness. For many visitors that is too much to do in a single day, especially during the really hot months, so build in another day to visit at a more relaxed pace. Unfortunately, we only had time to explore part of the vast complex at Petra, so we missed a few important locations like the Hadrian Gate and the Great Temple. If you plan to visit Petra, be sure to make time to see those places during your stay- we hope to see them on a return trip someday. It’s easy to explore Petra without a guide, but we were really happy to have a great one to help us make sense of what we were seeing. Our guide Hassan was able to introduce us to the symbolism of some of the more obscure carvings and monuments we saw, which really helped to bring Petra to life for us. Consider a guided tour if you will only have one day to visit, or consider a guide for your first visit if you will have two days. We learned information that we haven’t seen online or in history books, so we were grateful to have a knowledgeable local sharing the journey with us. Before you even begin your walk through the Siq you will be approached by locals offering horse or carriage rides. While some of them may be reputable, there have been plenty of reports of animal abuse and neglect due to overwork. 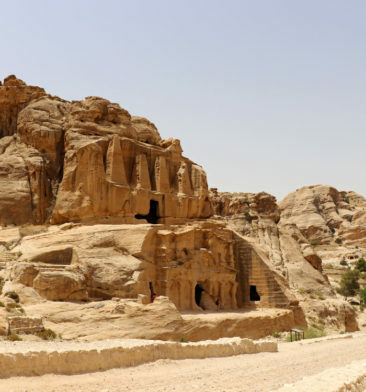 The carriages were initially introduced at Petra to help visitors with mobility issues reach the Treasury, but these days many people choose to ride to and from the Treasury instead of walking. If you are able bodied, take the walk instead of the ride. The horses go so quickly that you will miss most of the Siq’s incredible features, and it’s hard to tell the difference between the people who care for their animals and those who do not. If you do accept a horse ride (which is included with your entrance fee) it does not include a tip, which is all but mandatory. If you select a carriage ride, they are expensive and the price you are quoted up front is typically just for one way; expect to pay the same amount or more for your return to the visitor’s center. We were offered the chance to take a 10-minute hike for a view of the Treasury from above by dozens of industrious locals looking to make some extra money. While this is a popular activity, we don’t recommend it. 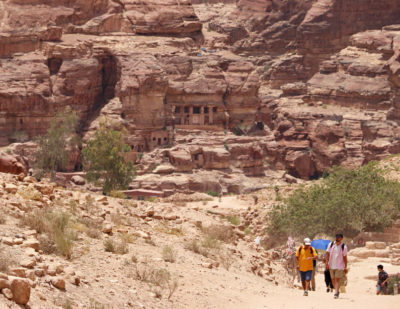 As a UNESCO World Heritage Site, Petra is a protected area that can be negatively impacted by the foot traffic its ruins experience. Officially, climbing Petra’s unmarked trails is not encouraged or allowed. 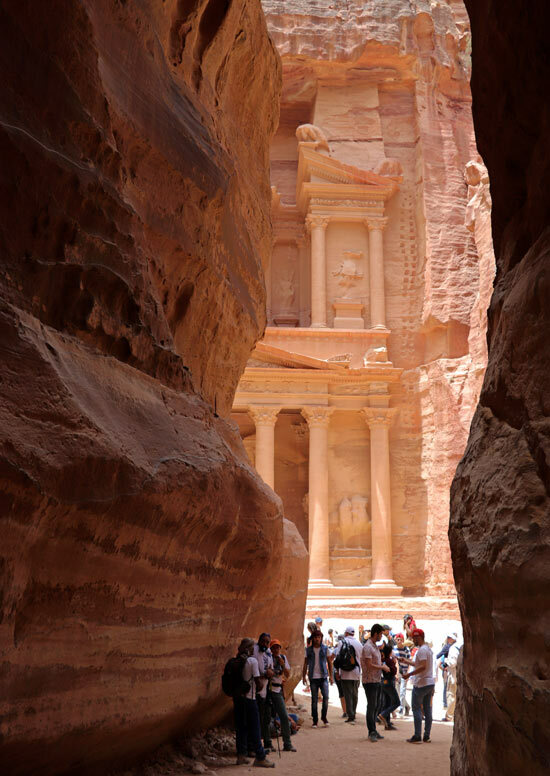 Although plenty of locals will offer to show you the route for “Instrgram-worthy” Petra photos, we don’t recommend any activity that is not endorsed by the site and may negatively impact it for generations to come. We stayed at the Petra Sella Hotel, which was a great experience for us. Petra Sella is not that close to Petra itself; it’s a short taxi ride away (just about one mile up the hill from the visitor’s center). The hotel is clean and modern; the air conditioning was strong and cold, the shower was big with great water pressure, and the internet was fast and free. We slept more than 10 hours in a very comfortable bed before catching the very end of a great buffet breakfast, and as we checked out of the hotel we were treated to steaming hot Turkish coffee while we waited for our transfer to Amman. 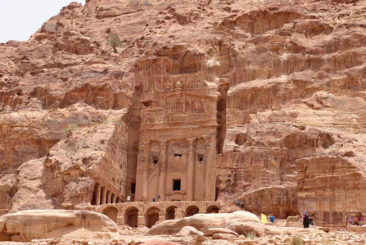 Petra Sella was a great choice, and if we are lucky enough to visit Petra again we’ll look forward to another stay. 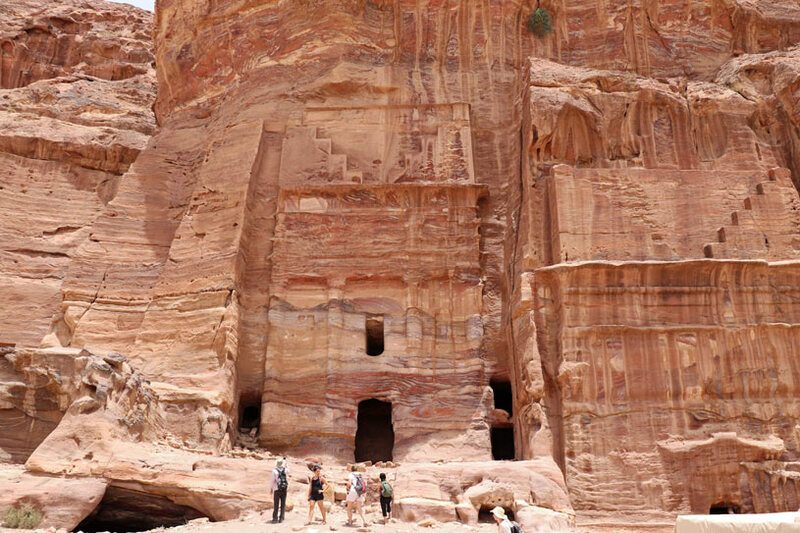 Looking for more hotel options in Petra? 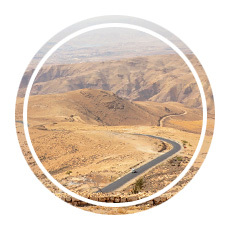 The closest town to Petra is Wadi Musa, so that would be the place to start your search. Here are some deals to consider. Petra is everything we wanted it to be. It is historic, charming, magnificent, and surprising, and it is so much more than its famous Treasury. If you are also dreaming of a visit to Petra, don’t miss an opportunity to visit. 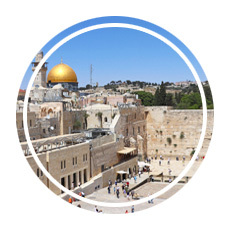 Whether you have just one day or you can extend your visit over a few days, Petra will leave a lasting impression that will stay with you no matter where you travels take you. 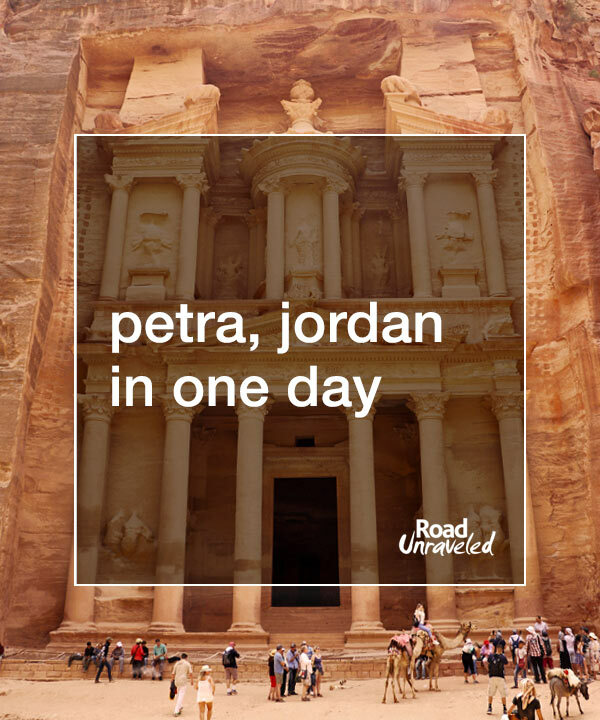 Leave a comment below and let us know if Petra is in your plans—and share your Petra travel tips with us! 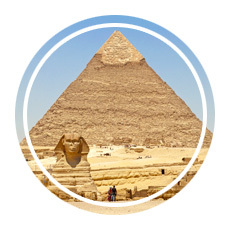 Want to discover a few more interesting places in this part of the world? Check out these articles!